Here are a few of the data stories that caught my attention this week. 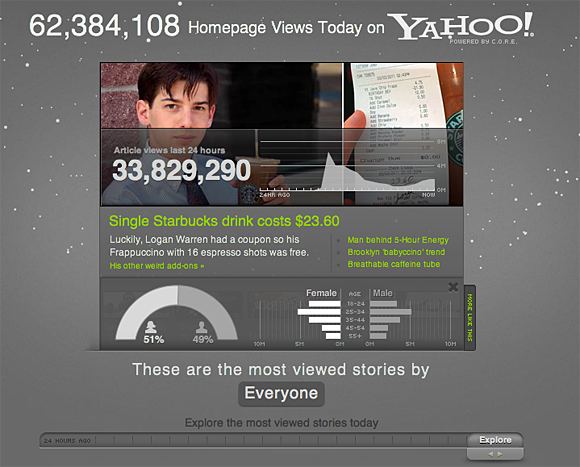 Yahoo offered a peak behind the scenes of its front page with the release of the Yahoo C.O.R.E. Data Visualization. The visualization provides a way to view some of the demographic details behind what Yahoo visitors are clicking on. "C.O.R.E. determines how stories should be ordered, dependent on each user. Similarly, C.O.R.E. figures out which story categories (i.e. technology, health, finance, or entertainment) should be displayed prominently on the page to help deepen engagement for each viewer." Screenshot from Yahoo's CORE data visualization. See the full visualization here. Over on the High Scalability blog, Todd Huff examines how the blogging site Tumblr was able to scale its infrastructure, something that Huff describes as more challenging than the scaling that was necessary at Twitter. "Growing at over 30% a month has not been without challenges. Some reliability problems among them. It helps to realize that Tumblr operates at surprisingly huge scales: 500 million page views a day, a peak rate of ~40k requests per second, ~3TB of new data to store a day, all running on 1000+ servers." Hoff interviews Blake Matheny, distributed systems engineer at Tumblr, for a look at the architecture of both "old" and "new" Tumblr. When the startup began, it was hosted on Rackspace where "it gave each custom domain blog an A record. When they outgrew Rackspace there were too many users to migrate." The article also describes the Tumblr firehose, noting again its differences from Twitter's. "A challenge is to distribute so much data in real-time," Huff writes. "[Tumblr} wanted something that would scale internally and that an application ecosystem could reliably grow around. A central point of distribution was needed." Although Tumblr initially used Scribe/Hadoop, "this model stopped scaling almost immediately, especially at peak where people are creating 1000s of posts a second." Data scientist Pete Warden offers his own lessons learned about building visualizations this week in a story here on Radar. His first tip: "Play with your data" -- that is, before you decide what problem you want to solve or visualization you want to create, take the time to know the data you're working with. "The more time you spend manipulating and examining the raw information, the more you understand it at a deep level. Knowing your data is the essential starting point for any visualization." Warden explains how he was able to create a visualization for his new travel startup, Jetpac, that showed where American Facebook users go on vacation. Warden's tips aren't simply about the tools he used; he also walks through the conceptualization of the project as well as the crunching of the data. Brooklyn’s Park Slope neighborhood is already experimenting with a version of the system, and so are San Francisco, Seattle, and Washington, D.C. In D.C. you can now pay many parking meters via cell-phone. I’ve used the system and it works well. Here are previous MR posts on parking. Chances are, you're reading this article after clicking on a shortened link. And if, like many modern infovores, your online reading is driven by your social network rather than your feed reader, most of the pages you've visited today were mediated by a shortened link. Link shorteners have become ubiquitous over the last few years, and they're an increasingly important part of the social fabric of the web. But is that a good thing? Below I explore some of the issues to be aware of, both as a user of link shortening services and a consumer of shortened links. Link shorteners have been around for a number of years. Wikipedia notes that the first link shortening service, TinyURL.com, launched in 2002. Back then the primary need for shortened links was avoiding line-wrapping issues, which could break long links in some email readers. In the years since, the web development community has recognized the utility of simple, readable URLs that are free of implementation cruft. URLs tend to be tidier than they once were. But the need for even shorter URLs has been driven by constrained user interfaces, either because of hardware issues or artificial constraints imposed by particular services. It's no fun entering long URLs on a mobile device, and who wants to waste tweet space on URL characters? The sharp rise in the number of shortening services -- there are more than 180 services in this list -- has been accompanied by a race to the bottom: who can generate the shortest URLs by creative use of domain name registration and by compressing URLs into as few characters as possible? But while brevity might bring users to a service, it doesn't necessarily bring revenue. Value-added mediation features, such as access to click-through statistics on individual URLs, has given services another dimension. Bit.ly's live usage statistics, and its previously close relationship with Twitter, has made it beloved by many. The statistics Bit.ly and other services offer combine web analytics with your social media influence. They answer the question: How much traffic did you drive today? The issues surrounding URL shorteners all follow from the shorteners acting as an intermediary for destination websites. As more web users find new content via shortened links, certain shorteners may emerge as considerable referral generators for some sites. If a service goes down, traffic could be temporarily blocked. We don't often think of the web as a long-term medium, but we should. There's very little truly ephemeral content on the web anymore. The 301Works project from the Internet Archive is intended to address the issue of URL shortening services going permanently offline, providing an escrow service for link shorteners with the hope of preserving the integrity of more of the web. And, as recently illustrated by the take-down of vb.ly, there are more than just financial reasons why a site might go offline. Legal and ethical issues can arise, requiring developers to consider more than just what makes a short or cool-sounding domain name. Some sites now offer their own domain-specific URL shorteners (e.g. youtu.be, goo.gl, t.co) that don't suffer from the same issues. These are more likely to offer the same resilience and stability as the sites themselves. As a user, you're better off turning to these services where available. It's hard to tell what's at the end of a shortened link. From a user-interface point of view this can be frustrating. How many times have you followed a link in a tweet to find that it's actually something you've already read? But that lack of visibility can be more than just frustrating, it's also a possible vector for a phishing attack. If a URL shortener is hacked, as happened with cli.gs, then once innocuous links can suddenly become spam vectors. Some services do apply a spam filter to shortened links, while others offer a preview mode or tools to increase visibility of the destination site. However, in the latter case, the user of the link usually has to take some additional action before following a link, making these less than ideal. Again, domain-specific URL shorteners are likely to be more secure, if not more transparent than third-party services. URL shorteners inevitably add overhead, requiring additional DNS lookups and HTTP requests. Domain-specific shorteners suffer in this regard just as much as third-party systems. Waiting for an additional web request can be particularly irritating on patchy mobile connections. For many users it won't be clear where performance issues lie: Is it the link shortener or the target service that's slow? The role URL shorteners play in routing increasingly large chunks of Internet traffic makes their performance significant. It also makes them a highly visible target for denial of service attacks. An often overlooked issue with URL shorteners is that they have the ability to track the links you're following across the web. Several services hand out tracking cookies as links are followed. It's this facility that underpins the shorteners' ability to offer usage statistics, although none yet offer the ability to track individual users. But, if you're the type of person who is concerned about how your Internet usage is being recorded, then this is yet another avenue to consider. In all likelihood, URL shorteners are here to stay. As users and developers of web services we ought to understand when they are and aren't useful, and what alternatives are available. Domain-specific shortening services avoid many of the issues identified here, but they don't offer the same cross-site analytics that are the unique selling point of third-party services. Disclosure: O'Reilly uses bit.ly Pro for its shortened domain, oreil.ly. O'Reilly AlphaTech Ventures (OATV) is also an investor in bit.ly. Im Jahr 1949 fotografierte ein Mann namens Chalmers Butterfield das Straßenleben in London in der tiefen Farbenfülle von Kodachrome. Drüben bei How To Be A Retronaut, wo solche raren Funde gesammelt werden, gibt es zwei weitere Aufnahmen von Mr. Butterfield. Alkohol am Steuer = Fegefeuer. Wäre Frau Käßmann eine 17jährige Komasäuferin, würde sie, von fünf Sozialarbeitern flankiert, zu einem mehrwöchigen Nachreifungs- Erlebnis -urlaub nach Lanzarote geschickt. Wäre sie Chef eines anderen Großunternehmens, bekäme sie einen Dienstwagen mit Chauffeur, damit sie beim Fahren nicht so viel verschüttet. Wäre sie die geschiedene Frau mit vier Kindern und Vollzeitjob, die jeder von nebenan kennt, würde sie jemand in den Arm nehmen; mindestens 1mal im Jahr, wenn sie beim Betriebsausflug nach dem ersten Pikkolöchen flennt. Wäre sie Otto NormalverbraucherIn, würden längst alle Personalräte daran erinnern, dass Alkoholabhängigkeit eine Krankheit ist und kein dienstliches Fehlverhalten. Aber als Frau, als geschiedene Frau mit vier Kindern an der Spitze der EKD, wird sie nun gekreuzigt werden. So why did I title this article "Innovation Battles Investment"? I'll call the Triumph of the Singularity. don't. But I'll return to this point later. moment we're privileging the port we use for an MPMG. But the providers can't see doing quality of service any other way. the disruptive innovators we've enjoyed on the Internet. being fought out in the field of "network neutrality."